Thinking of getting your first business website, or maybe your just planing on upgrading your existing business website for a more modern version. If either of the statements above apply to you, it would be wise to take a second and read the rest of this post! You could save yourself a lot of time and effort. WordPress is what we call a Content Management System, or CMS for short. A special type of website that easily lets you add and edit your own content, be it a blog post, new product, some nice photos or a new promotional video. 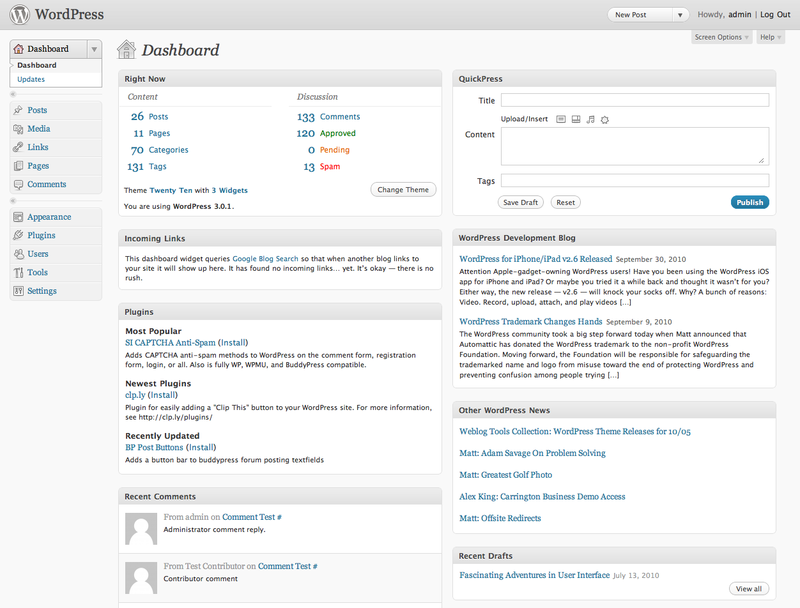 This is all done using the WordPress admin dashboard. 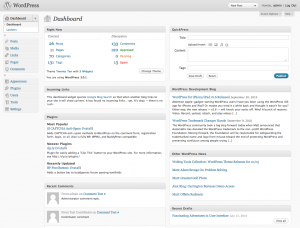 The dashboard, show above, lets you easily add and edit content, but it does a whole lot more. In fact, it provides complete control over the look and functionality of your businesses website. Media Managment – View & edit all your images and videos in one place. Plugins – Improve the functionality of your website with the enormous selection of WordPress plugins available. Users – Manage who has access to your website and the WordPress dashboard, create new users, change passwords, etc. All the above come as standard when WordPress is set up. Why You Should be Using WordPress For Your Business Website! One of the best features of WordPress is the ability to add plugins and themes, both of which allow you to customise your business website to meet your needs exactly. With almost 25,000 plugins available for WordPress, there is one for pretty much everything. Plugins provide extra functionality for your website, sometimes working in the background to improve the likes of Speed, Search Engine Optimisation, Security & Backup or User Managment. Other times they become a part of your website, for example a Contact Form, Social Media Integration or a Portfolio of you Work. Themes are the clothes your website’s wearing, they decide how it will look. With the enormous supply of themes available for WordPress there’s nearly always something for everyone. Of course if you are after something a bit different or looking to move to WordPress and convert your existing design, it’s easy to find a WordPress developer that can create something special for you. The last thing to mention is security, WordPress is a well maintained and constantly evolving platform. Because of this it’s safe to assume that security is always tight as long as the site is regularly kept up to date. In addition to the build in security there are a few good plugins and apps that can further enhance it. Click here to read an article on securing WordPress. It has to be mentioned though that it’s important to make sure that a regularly backed up is kept, no website is ever 100% safe from hackers and other unscrupulous individuals. I hope you’ve managed to gain something from this article and now can see some of the many benefits of using WordPress for your business website. If you like the sound of WordPress and taking back control of your website, please get in touch, we can provide a free website audit for your existing website we’ll let you know how easy it would be to move to WordPress.